I’ve read quite a lot about Rock, Metal, and all that goes with it, but as far as I could remember I haven’t read a story, not history that I know by heart. Since I was 14 I’ve been very curious about what has caught my attention, and my lifestyle would not be an exception to this “longing for knowledge”. Something very grateful (and I mean very), is the absence of Satan in this book. Metal has always been connected with the dark side of this world, and the cliché of using Satan has been very annoying to me, why there are so many ignorants in this world that could only think that Metal is satanic? Satan should come to take them all J. (Underlined because it’s funny to imagine that). But, has someone imagined what a small band has to go through to become a great one? Has somebody asked why metal keeps going along the ages, although it seems to like to nobody? These bands that are part of our lives, had a rough start, when they have to fight for getting on stage, to promote their music, to keep themselves alive in this big world of Metal. EVISCERATED PANDA is a band playing Thrash Metal, these kind of bands that begin from the lowest step of the stairs, making their way to the top, but they don’t give up, around England they plan their moves while drinking, in order to play the first gig and release the first album; many people may find themselves reflected here, just because it’s a common motion around a Metal band: beer. 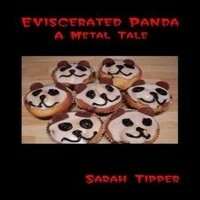 “Eviscerated Panda: A Metal Tale” is a book very fun to read, Sarah Tipper took the time to give a very well defined personality to each character, with relationships demarcated, making the background development of the book, feel very real and even sometimes making reflections that you can use in reality. One of the things that I really like about the book is the importance that Metal has, is the center of the story, this is no joke, and still is very fun. For me it was easier to see the hard work and study that Sarah put into her writing. She refined touches along the relations developed here, always having the Metal music as the most important thing to the characters. If you are an expert in Metal, this should, and I mean should, be in your library, why? Because along of what the Metal bands have written in the history, a tale like this where you could imagine your role, or put somebody in it, is always very grateful to read and to share, and this novel has reunited all what I desire from a story: Beer, Metal and Laughs.